I’ve never considered myself a whiz when it comes to numbers or complex financial matters. Therefore, I am often looking for better ways to think about financial stewardship, and stretching my dollars. 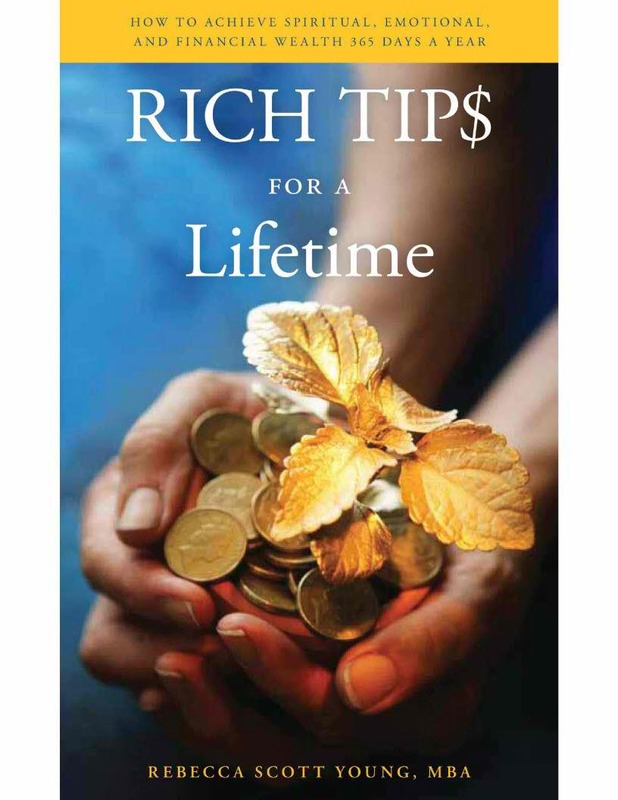 So when Rebecca Scott Young invited me to review her recent publication, Rich Tips for a Lifetime, I happily said YES! For those of you who don’t feel incredibly savvy about finances, you will find this little book a breath of fresh air. Every chapter is backed with solid strategy and logic, but this powerful information is artfully presented in a way that doesn’t require you to have a degree in accounting to get it. Rebecca’s book caught my attention because it’s not just about doing more with your money — it’s a challenge to work toward spiritual, emotional and financial wealth every day. Rich Tips for a Lifetime is about changing the way you approach spending, and a wake-up call for those who always have an excuse for why they aren’t saving and investing. With Rebecca’s step-by-step strategies, she shows you how you can invest in your future, even if you are on a mercilessly tight budget. The chapters on shopping and spending tips alone could save the average woman thousands of dollars a year to invest elsewhere for a bigger return than the joy of another pair of shoes, or facial. And don’t think it’s all about sacrifice, she even has a chapter on how to splurge better — yes, splurge! As with any change in life, learning how to live a richer, fuller life starts with how you think about money. To move yourself in a direction of abundance, you must first create a plan, organize your approach to it, and then take action. As you examine your thoughts and potential hangups around money, this book will help you identify where your thinking might be holding you back. At the end of each easy to read chapter is an action item to push you to move forward with the information you just learned. Rich Tips for a Lifetime is certainly not your run of the mill, dry as toast book about finance. It’s a no-nonsense guide to thinking sensibly about your money, and what it means to be wealthy in life. You will be challenged to do the work, and some of it might be hard. But learning to leverage your assets, whether financial, spiritual, or emotional will reap huge returns in the long run. So if you feel you are in the need of some tweaking when it comes to your financial house, I highly recommend this book as a way to get moving in a more lucrative direction in your life. If you are interested in learning more about this book, visit Rebecca’s website (non-affiliate link). This entry was written by Dr. Shannon Reece, posted on June 7, 2012 at 1:15 pm, filed under Book Review and tagged finance, making money, Rebecca Scott Young, strategies for women, wealth. Bookmark the permalink. Follow any comments here with the RSS feed for this post. Post a comment or leave a trackback: Trackback URL.